GM Part# 24507946, 24503680. This item has been removed from a Zero Mileage engine. Contents : 1 Crossover pipe exactly as photographed. Manufacture : OEM General Motors. Buick Regal 4DR GRAND SPORT 1997, 1998. Semi-Direct Fit Flange Pipe Repair Kit. Downstream Flange Of Rear Converter. Flange Width: 3 3/4". Flange Height: 3 7/32". Flange Thickness: 3/8". Flange Material: Mild Steel. Pipe ID: 2". Pipe OD: 2 5/32". 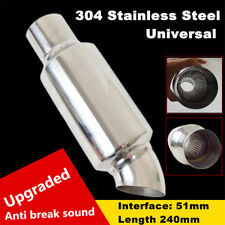 38-51mm Motorcycle Stainless Steel Silencer Exhaust System Muffler Tip Pipe Kit. 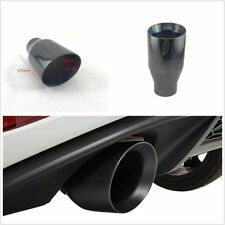 DIY 4X 63-93MM Glossy Carbon Fiber Exhaust End Tail Tip Pipe Muffler Tail Throat. 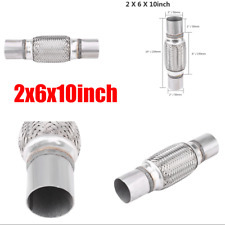 Universal 65mm Glossy Car Thickened Real Carbon Fiber Exhaust Dual Twin End Pipe. NEW Exhaust Crossover Pipe. Exhaust Pipe Material: Steel. Dorman #: 679-002. More like a complete kit than a single part, Dorman's Exhaust Crossover Pipe includes all necessary gaskets and hardware for a complete installation. Outlet: 89mm. Size Inlet: 63mm. Material Type: Steel Carbon. Light weight and durability ,high quality of Stainless steel. Note: This price is just for one piece! Auto car universal end Pipes. 1x Part# 700235 muffler. 1x Part# 35232 Muffler bracket. 1x Part# 35233 Muffler bracket. 1x Part# 35229 Rubber Muffler Support. System Includes. Part must be new, uninstalled, in original box. you in error or showed up defective. To avoid the exhaust pipe burn when the car just stopped or started. 1x car exhaust pipe. Material:Stainless steel. Color: Matte Black. T304 Stainless Steel Pipe 14 Gauge. Applications: Header, Downpipe, Catback, Exhaust Muffler. Universal Stainless Steel Straight Pipe. There is no flanges or bolts. User must follow the direction given and any misuse of this product is at his/her own risk. The distance between the tail pipe and the bumper should be above 2cm to avoid scalding by hot exhaust bumper. Simply fits over the existing tail pipe. 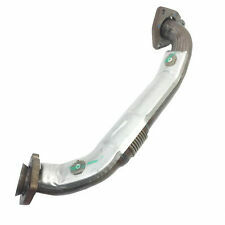 Gently curved exhaust pipe, anti-corrosive, corrosion resistance, durable. Applications: Header, Downpipe, Catback, Exhaust Muffler. Universal Stainless Steel Straight Pipe. T409 Stainless Steel Pipe 14 Gauge. There is no flanges or bolts. User must follow the direction given and any misuse of this product is at his/her own risk. Part Number: 78194. This part�s position is Rear. Note: This part fits multiple vehicles - Review the notes section in the compatibility chart to verify the position of this part on your vehicle. Item Specifics. 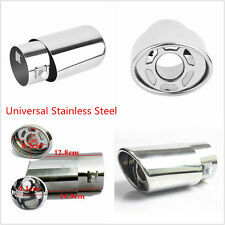 Black Oval Bent Car Exhaust Pipe 62mm Muffler Tip Cover Stainless Steel Universal. To avoid the exhaust pipe burn when the car just stopped or started. Material: 304 Stainless steel. Made of stainless steel, anti-corrosive,durable.